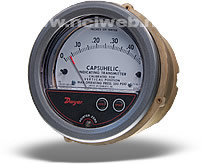 The Dwyer Series 631B Differential Pressure Transmitter monitors differential pressure of air and compatible gases and liquids with accuracy. The design employs converting pressure changes into a standard 4-20 mA output signal for two wire circuits. Digital push-button, zero and span adjustments are easily accessed on the front cover. The Series 631 Differential Pressure Transmitter is designed to meet NEMA 4X (IP66) construction. Robust housing offers 500 psi static pressure rating on ranges down to 0.5" w.c.
A-276 - Precision resistor, 500 ohm. A-277 - Precision resistor, 250 ohm.